A study by scientists from Oxford University and the Royal Ontario Museum suggest that dinosaurs survived by shrinking their bodies eventually evolving into birds. The study suggests that the dinosaurs went through a huge range of shapes and sizes over these years. And those species that decreased their body mass, survived and became birds. This evolution helped the dinosaurs maintain their presence, albeit in another much smaller form, and allowed them to continue exploiting new ecological niches throughout their evolution. It has been only more than two decades that the idea that birds evolved from dinosaurs have entered mainstream acceptance. This can be largely attributed to the movie "Jurassic Park" which broached the theory to the public and garnered massive acceptance. Although some of the facts in the movie turned out to be wrong, the dinosaur to bird evolution theory still remains. There have also been fossils discovered that suggests that some dinosaurs have feathers just like their current cousins. And there are also some, like the Microraptor had wings. A study that has 'weighed' hundreds of dinosaurs suggests that shrinking their bodies may have helped the group that became birds to continue exploiting new ecological niches throughout their evolution, and become hugely successful today. An international team, led by scientists at Oxford University and the Royal Ontario Museum, estimated the body mass of 426 dinosaur species based on the thickness of their leg bones. The team found that dinosaurs showed rapid rates of body size evolution shortly after their origins, around 220 million years ago. However, these soon slowed: only the evolutionary line leading to birds continued to change size at this rate, and continued to do so for 170 million years, producing new ecological diversity not seen in other dinosaurs. A report of the research is published in PLOS Biology. 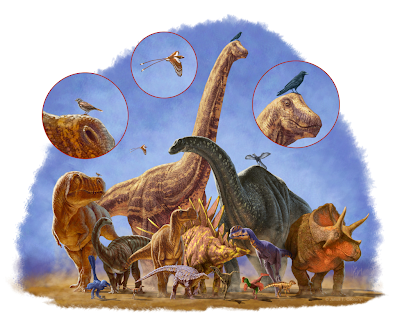 The team believes that small body size might have been key to maintaining evolutionary potential in birds, which broke the lower body size limit of around 1 kilogram seen in other dinosaurs. 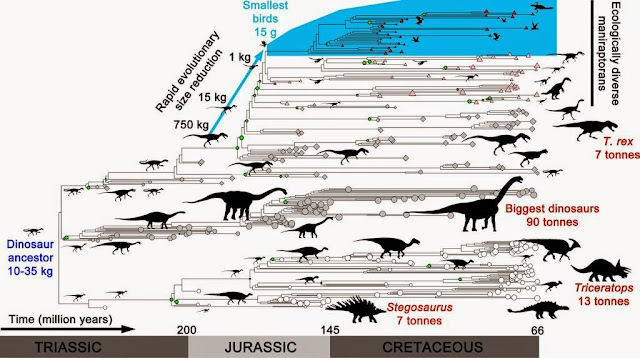 The team examined rates of body size evolution on the entire family tree of dinosaurs, sampled throughout their first 160 million years on Earth. If close relatives are fairly similar in size, then evolution was probably quite slow. But if they are very different in size, then evolution must have been fast. The evolutionary line leading to birds kept experimenting with different, often radically smaller, body sizes – enabling new body 'designs' and adaptations to arise more rapidly than among larger dinosaurs. Other dinosaur groups failed to do this, got locked in to narrow ecological niches, and ultimately went extinct. This suggest that important living groups such as birds might result from sustained, rapid evolutionary rates over timescales of hundreds of millions of years, which could not be observed without fossils.